Tucked away in one of the corners of the IndieCade booth was publisher Loot Interactive. The company’s been around for some time, toiling away at making items for the now defunct PlayStation Home, but they’ve just recently become a fully independent publisher. Their lineup this year consisted of ports of PlayStation 4 and Vita ports of indie games from the last year, but it’s a solid group of games, all the same. The first game was Whispering Willows, a horror-themed adventure game wherein you play as a young women looking for her missing father. The demo began with Elena falling into a crypt while on her way toward the mansion where her father was last seen. Soon after, she meets a ghost who tells her that she can split her spirit from her body due to the shamanic powers passed down through her family. 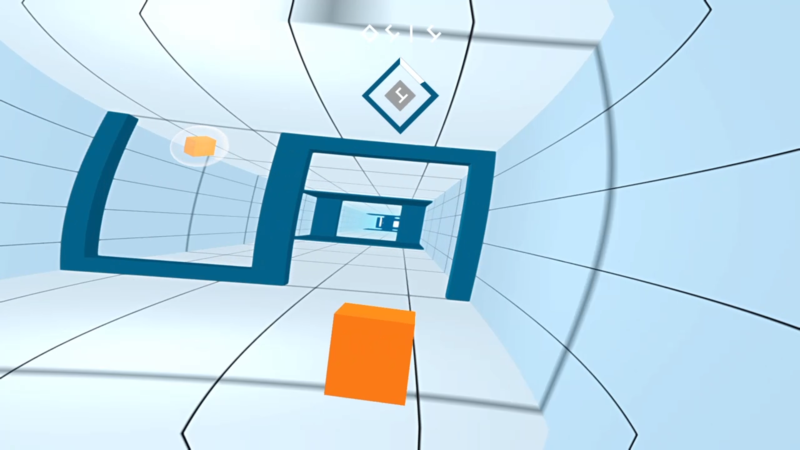 Gameplay revolves around exploration and light puzzle solving, mostly in the form of using Elena’s spirit to move between rooms to throw switches so that her physical body can progress. Cracks in the walls and ceiling allow her to spirit to bypass locked doors and other obstacles. Pretty rudimentary stuff, but the relaxed pace of it all is nice. It’s slow and deliberate, allowing tension to build for when it decides to unleash a scare or two. The crypt section ended with a hostile spirit chasing after Elena, which didn’t prove too difficult to escape. Next was Velocibox, an endless runner in which you slide and jump around to avoid obstacles while moving at blistering speeds. You control a box sliding through a long rectangular corridor, avoiding pillars, walls, and other myriad obstacles. Or that’s the idea. In reality, you’re gonna end up crashing into those objects more than you will avoid them. I had to be constantly preparing to dodge distant obstacles than focus on what was in front of me because the game moved so fast. Reactionary maneuvers didn’t work because the box slides across the room just slowly enough to punish you for not looking ahead. Each level transitions seamlessly into the next, never giving you a moment to breathe. The further you get, the more intense the levels become. At their worst, obstacles start materializing before you, while others oscillate across the room, making it nigh impossible to avoid them. If that doesn’t sound hard enough, the game will also include a classic mode where you try to finish all the levels in one go. Given how difficult clearing each level individually is, however, I can’t imagine how anyone could do that. Last was Back to Bed, a puzzle game where you guide a sleepwalker by the name of Bob back to bed through M.C. Escher-inspired dreamscapes. You do this by carrying and placing objects down in his path to redirect his movements. Every wall he touches turns him 90 degrees clockwise. He walks slowly, so you have plenty of time to assess the room and figure out how to tackle it. Even so, there’s a sense of urgency. Because the solutions eventually become predicated on Bob being in just the right spot at the right time, you start to move quickly to set everything up well in advance as much as you can. Most of the puzzles I tackled were simple enough that I was able to solve them with plenty of time to spare – which allowed me to fast-forward to the end – but the last couple I tried were a lot more dependent on fleet-footed action. Bob would often make a few quick turns in areas with nothing to meet his stride that I had to swiftly move my block around to stop him from falling off the edge of the platform. It may be a small tweak, but it definitely goes a long way toward making the puzzles tricky. Both Velocibox and Back to Bed will be out sometime this summer. Whispering Willows is out now, and we’ll have a full review for it in the near future.